Brownie – SPAK will snack. Chocolate ice cream. We don’t even know what else to say. Tomorrow is National Jelly-Filled Donut Day! TODAY IS NATIONAL BUTTERSCOTCH BROWNIE DAY AND NATIONAL MOSCATO DAY! Not too much to say about this first item. AK made a batch of homemade, from-scratch brownies using this recipe and they were delicious. It’s a good thing we had SP‘s friends over to pawn off some of this treat on them. The rest will go to coworkers. The thinner we spread the love, the less weight we all gain! Right? Or something. The butterscotchiness is subtle and much more round of a flavor than you’d get using butterscotch chips. And, contrary to what you’d believe, it’s not just a mixture of butter and scotch. As much as this guy would want to believe it. The other part of today celebrates the wine that non-wine-drinkers drink: Moscato! It comes from the muscat grape, and has skyrocketed in popularity in the last few years. It is the number 3 selling white wine in the US. This is due in large part to its popularity among young people, and across many “demographic groups.” Basically, Kanye and Drake have talked about Moscato, so now everybody drinks it instead of Champagne. We enjoyed it! AK doesn’t normally like carbonated things, and this one was definitely a little bubbly. But it was still enjoyable. Didn’t really feel like high class, but it wasn’t Sutter Home. No offense. Tomorrow is National Shrimp Day! 50/366, can you believe it? IT’S NATIONAL CHOCOLATE MINT DAY! With Girl Scout cookies abounding these days, it’s hard to turn down a box of Thin Mints. But as all people focused on losing weight will tell you, sometimes you really have to weigh the consequences and decide if it’s really worth it to buy a box. You can make a donation the troop directly, though, if that is the source of your guilt. We decided to use the leftover Peppermint Patty today to get to our chocolatey minty. We handed it over to SPom and she whipped up these amazing brownies. Brownie mix, lightened up, with a little bit of peppermint extract in the batter. Then, distribute the bits of peppermint patty. We were all pleasantly astonished at how well the patty melted. They were so, so, so good. The extra-dark pieces in there are the remnants of the patty. AK really loved the gooey inside, and SP especially liked the crisp edges’ contrast. SPom really works wonders, doesn’t she? Tomorrow is Cherry Pie day! NATIONAL CREAM CHEESE BROWNIE DAY! Still, they look really pretty. They don’t taste all that cream cheesey. AK put a couple baking discs on just for the buttoned look. 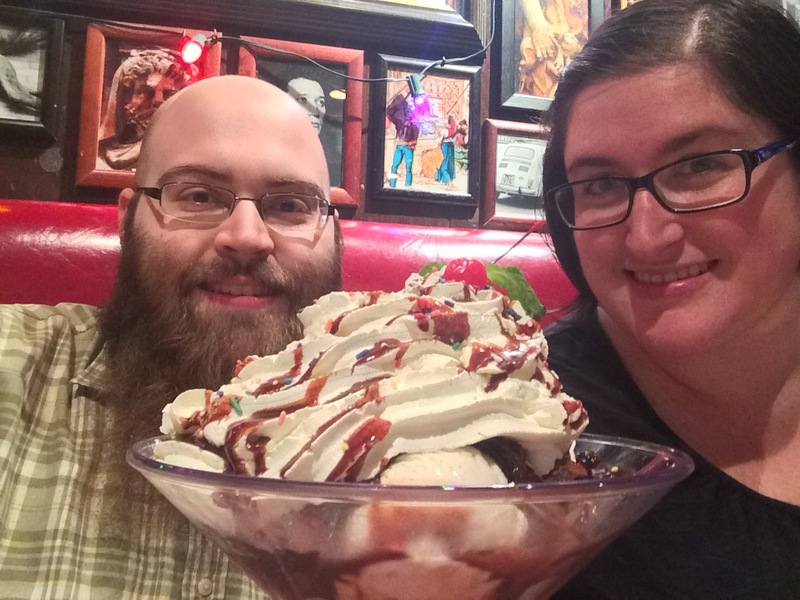 If we were to do this all over again, we might have lightened up the brownie mix. Just going by the box means putting in 2/3 cup oil. TWO THIRDS OF A CUP. DO YOU PEOPLE EVEN?! There are always ways to trim things down without sacrificing any flavor. You can sub in applesauce for some of the oil, you can just lessen the oil or sugar by 25%, you can cut smaller pieces… Whatever you do, don’t stand by the pan too long. Brownies are a killer. Again, leftovers will be brought for SP‘s coworkers. Tomorrow is National Peppermint Patty Day! We’ve got a fun one in store for you. A brownie without chocolate? What? IT’S NATIONAL BLONDE BROWNIE (A.K.A. BLONDIE) DAY! Well, that’s not so true. Some purists will claim that a real Blondie has no chocolate whatsoever. I think it’s more important to celebrate other shades of brown, like light brown/yellow-ish, especially when the whole spectrum of beige is usually tasty. But in this case we are talking about a brownie that’s made with brown sugar and vanilla, as opposed to cocoa. Sometimes people will throw in butterscotch or peanut butter, and that’s alright with us. Tonight we took the opportunity to eat one of SP‘s favorites, a Blondie from The Good Earth, and have it alongside a “regular” blondie from Applebee’s. Good on Applebee’s for continuing the spirit of doubling PR on food holidays. Since AK picked both of these up on the way home from work, she was able to get the blondie sans ice cream so that we can focus on the brownie itself. There was minor disagreement of taste between our heroes of SPAK. AK liked the Applebee’s blondie better. Without the peanut butter and chocolate, that one was more “pure” to what the blondie is about. A little sweet and a bit vanilla-y. SP preferred The Good Earth for how homemade it is, feeling the texture of the brownie and the mixture of all of the blending flavors. Still, it’s sugar and fat, so how could either be bad? Tomorrow is National Rhubarb Pie Day. Some people claim it’s National Pie Day, but they’re wrong. That is a holiday reserved for March 14th. So even though we’ll “observe” the day, we will be glaring at those calendar makers all day! I love me some coupons. Recently I received a (seemingly occasionless? 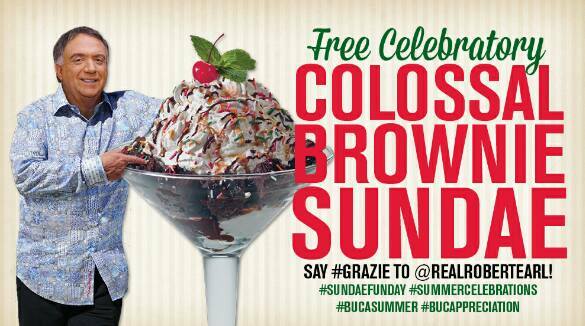 Happy June 30th to me, I guess) coupon from Buca di Beppo for a FREE/NO PURCHASE NECESSARY COLOSSAL BROWNIE SUNDAE. Being of the opinion that “no,” “purchase,” and “necessary” are some of the most beautiful words in the English language, I informed SP right away of this generous electronic gift that had been bestowed upon me, and we made our plans to not-purchase some dessert. 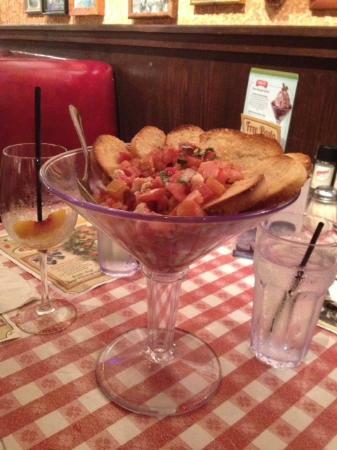 We felt guilty about not having any cash to tip with (plus we were still kinda hungry after a smallish dinner) so we ordered some bruschetta, and holy crap did we learn that all good things come in giant martini glasses. It turns out that entire thing is only 14 WW points, so our guilt was somewhat minimized. 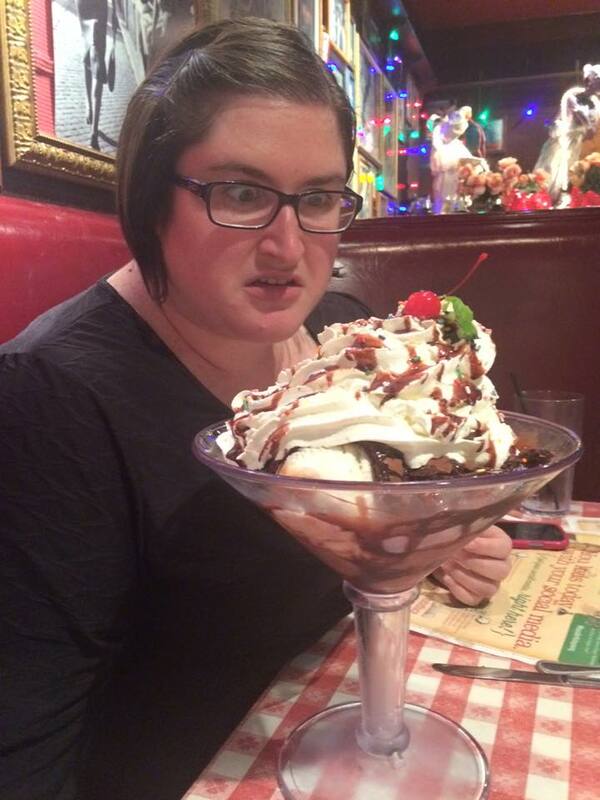 But then… then came the Colossal Brownie Sundae. So, we could safely eat about a sixth of it each. Which, in my case, turned out to be mostly whipped cream. All up in our freezer, now.